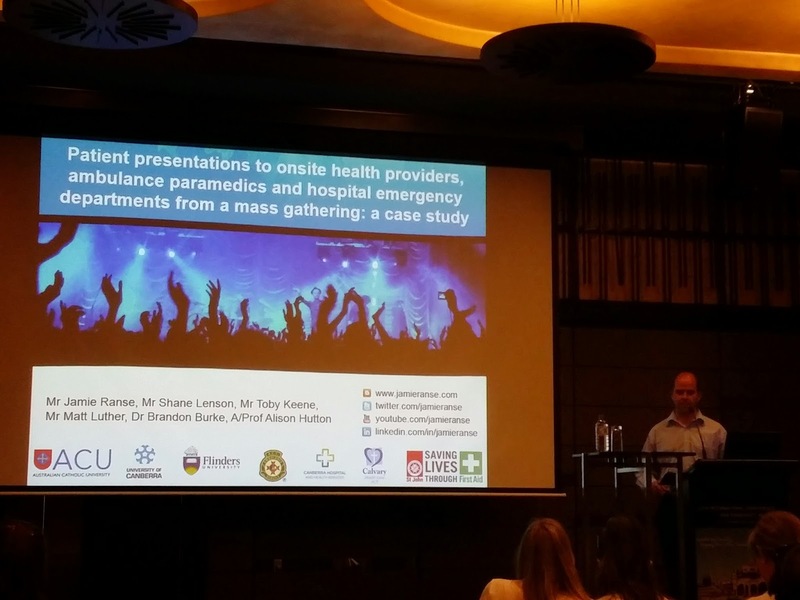 Patient presentations to onsite health providers, ambulance paramedics and hospital emergency departments from a mass gathering: a case study. Introduction: Health providers at mass gatherings aim to minimise the disruption to the health services of the surrounding community. The mass gathering literature focuses on patients presenting to onsite care providers at events, and scantly reports on patients presenting to prehospital care providers (ambulance paramedics) and hospital emergency departments (EDs). In 2012, an outdoor music festival with approximately 20,000 participants was held in Canberra. The festival had one first aid post, and a medical assistance team staffed by doctors, nurses and paramedics. This research describes the characteristics of patients and health service usage from this event. Method: Data was collected retrospectively from the event onsite care provider (St John Ambulance Australia) patient records. These records were linked to both prehospital (ACT Ambulance Service) and hospital EDs (Canberra Hospital and Calvary Health Care ACT) patient records. A preexisting minimum data set was used to code patient characteristics. Data analysis included descriptive statistics, such as frequencies and means of central tendency. Results: In total, 197 (9.86/1,000) patients presented for clinical assessment and/or management at the event. Two patients who required hospitalisation bypassed the onsite care providers and were transferred directly via the ambulance service to hospital. The onsite medical assistance team managed 22 patients (1.1/1,000), of whom two were referred to police, five transported to hospital and 15 discharged to the event. In total, seven patients were transported to hospital by ambulance (0.35/1,000). Hospital presentation rate and patient characteristics are currently being determined at the time of this abstract submission. Discussion: This is the first research to describe patient presentations to onsite care providers, prehospital and hospitals from a mass gathering. 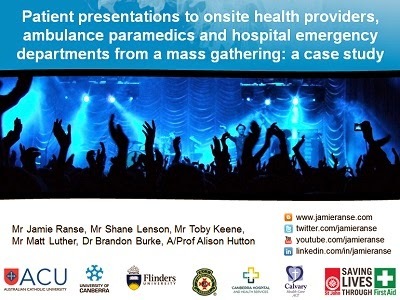 This research provides insight into the health service usage associated with mass gathering. Strategies to minimising the disruption to the prehospital and hospital health services of the surrounding community will be discussed. Ranse J, Lenson S, Keene T, Luther M, Burke B, Hutton A. Patient presentations to onsite health providers, ambulance paramedics and hospital emergency departments from a mass gathering: a case study. 12th International Conference for Emergency Nurses.